DEIR EZ-ZOR /Syria/, September 26. /TASS/. 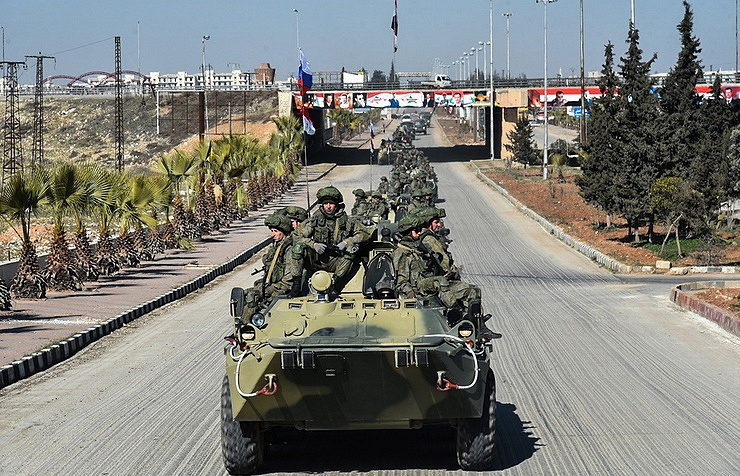 Russian road service military experts have erected a bridge across the Euphrates River, a few kilometers away from Deir ez-Zor in northeastern Syria. It will be used to deploy military equipment and troops to the eastern river bank. The MARM small motorway panel bridge was erected in less than two days under continuous shelling, Head of the Russian Defense Ministry’s Road Service Vladimir Burovtsev told reporters. "Unmanned aerial vehicles were used. Explosive substances and grenades were falling on us from the air during the installation work. However, we have no losses. No injured or affected. Everything was erected in the set terms," he specified. The bridge is 210 meters long. It can serve 8,000 cars a day. The bridge supports heavy armored vehicles, such as tanks, infantry fighting vehicles and multiple-launch rocket systems, Burovtsev said. The bridge will also be used for aid convoys to liberated communities and medical evacuations. Syrian state forces liberated most part of Deir ez-Zor in early September. IS’ (Islamic State, a terrorist organization outlawed in Russia) main forces were forced to retreat to the opposite, or eastern side of the river bank. Ahead of the bridge’s construction, only the advance detachments of the Syrian army crossed the river with the use of pontoons. Now the main government forces are preparing for mass crossing of the Euphrates.